JERUSALEM (Reuters) - An Israeli cabinet minister said on Monday he had been invited to attend a conference next year in Bahrain, in what he described as part of Israel's emerging relations with Arab and Muslim countries that do not formally recognise it. Israel's diplomatic push in the Gulf, where it sees Arab states as its natural allies against regional powerhouse Iran, has become increasingly public after years of covert contacts. 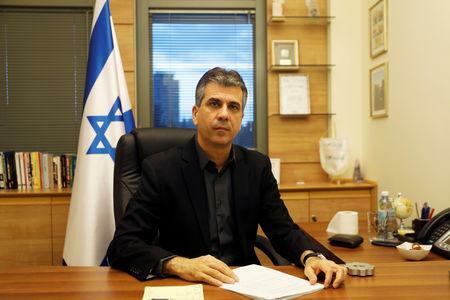 "I myself received a personal invitation to Bahrain," Israeli Economy Minister Eli Cohen said in a radio interview. Cohen told Army Radio the invitation was to a conference in the first quarter of 2019 "in the realm of technology and high-tech, in which the State of Israel is certainly a leader". He did not say whether he planned to attend. Asked to elaborate, an Israeli official briefed on Cohen's affairs said the event to which he had been invited was the Startup Nations Ministerial conference on April 15, a forum for public policymakers to discuss how to promote entrepreneurs. Bahrain, where a Saudi-backed Sunni Muslim ruling family faces a Shia-led opposition, is one of several flashpoints in a regional tussle for influence between Saudi Arabia and Iran. Manama is a close ally of the Saudis and Emiratis, Gulf forces that Israel has described as potential partners against its arch-foe Iran.